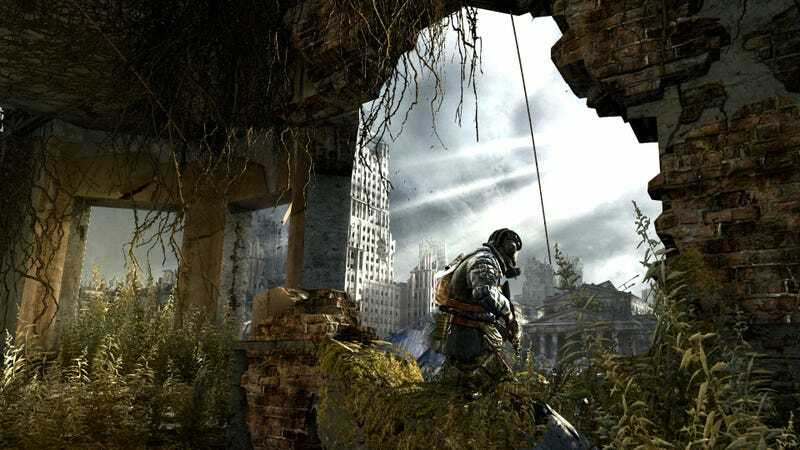 At a recent showcase for THQ games such as Darksiders 2 and Company of Heroes 2, the moody first-person shooter Metro Last Light stood out most effectively. And it had a creepy demo involving two Russian survivors of a nuclear attack who exited the protection of a fortified underground refuge to creep and shoot their way through a destroyed urban landscape.They explored a crashed plane, fought off beastly wolves and struggled all the while to find fresh air to breathe. 2) One of the game's developers says: "Our bid is to combat shooter fatigue…[to fight] against the sense that single-player is just a shooting gallery." 3) And he also says, "I'd love to say enjoy the demo but frankly I hope it gives you nightmares." That's pretty much enough for me. I want to play this thing.